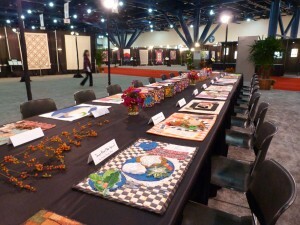 The IQA judged show was a feast for the eyes with so many wonderful quilts. 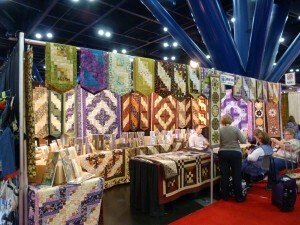 The award winners were not announced until after Market, but all the quilts were on display. It’s hard to select my highlights, but here are a variety that particularly appealed to me. 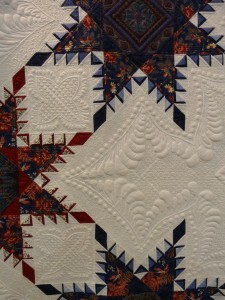 These two quilts are both original designs, hand appliqued and hand quilted and the workmanship is outstanding. On the left is Crest of Tulip, by Takido Fusako, Japan. Takido writes, “A spring flower, the tulip blooms proudly towards the sky. We can get energy from it as it flutters in the wind. 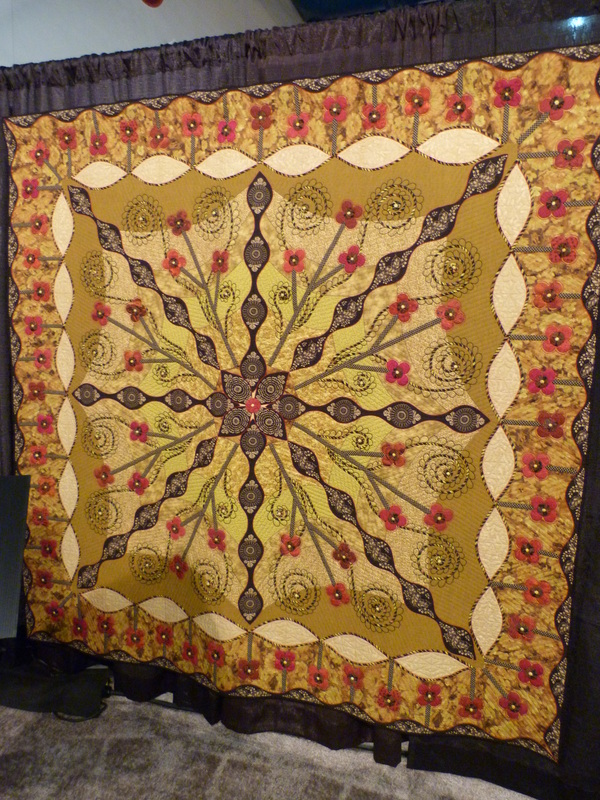 I made the tulip like a crest in the oval using trapunto.” Linda Roy, TN made Primitive Web. 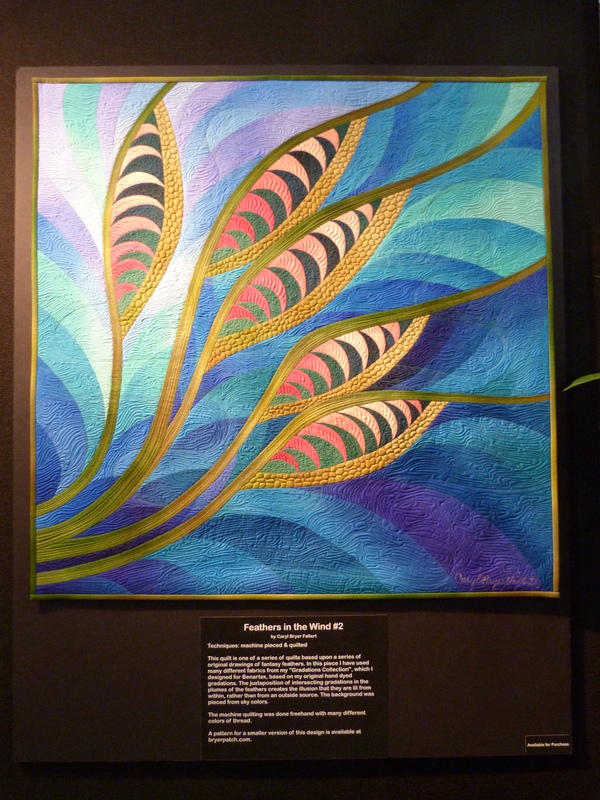 I’ve enjoyed seeing Linda’s beautiful award-winning work over the years since were were both beginning quilters when we lived in Arkansas and were taught to applique by Irma Gail Hatcher. 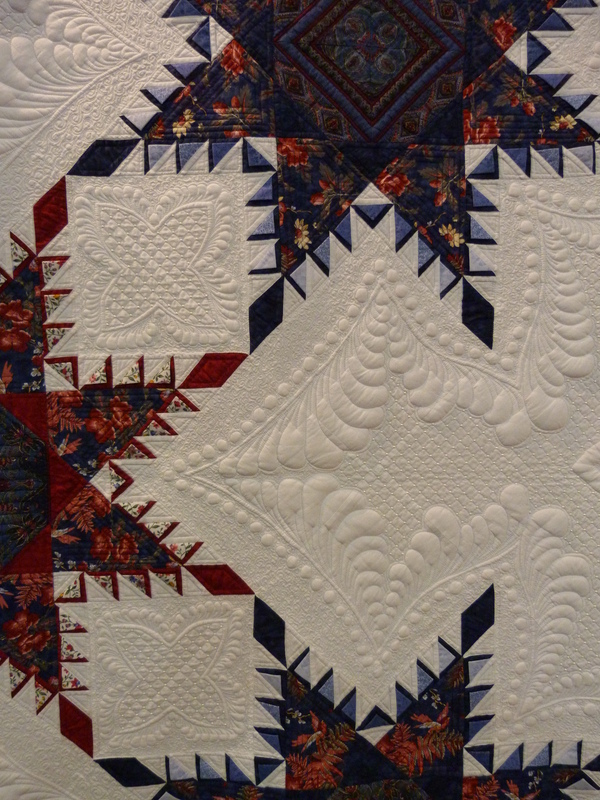 The design for this quilt was inspired by an antique all-hexagon quilt. 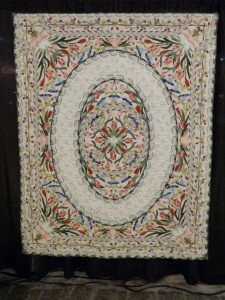 The feathers are embroidered and the stuffed Yo-yos in the flowers add dimension. 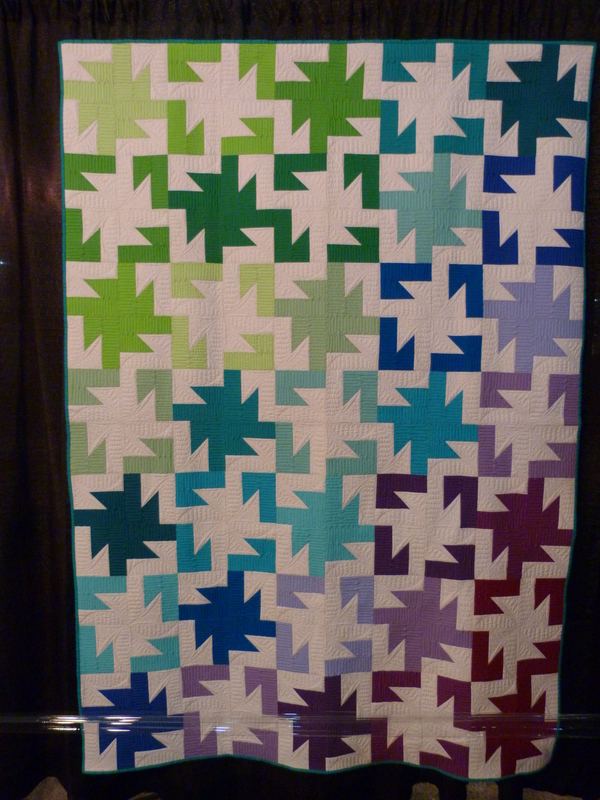 These two hexagon quilts are both hand pieced using the English paper-piecing method and are both machine quilted. They are awesome. 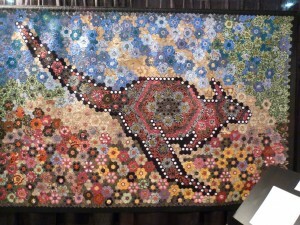 Roo Garden was made by Vicki Bohnhoft, AZ. Vicki writes, “Returning to Australia in 2009, I began collecting Australian Aboriginal fabrics. 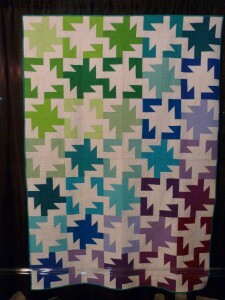 On our cruise, I became addicted to 3/4″ hexagons, eventually making over 5,000. 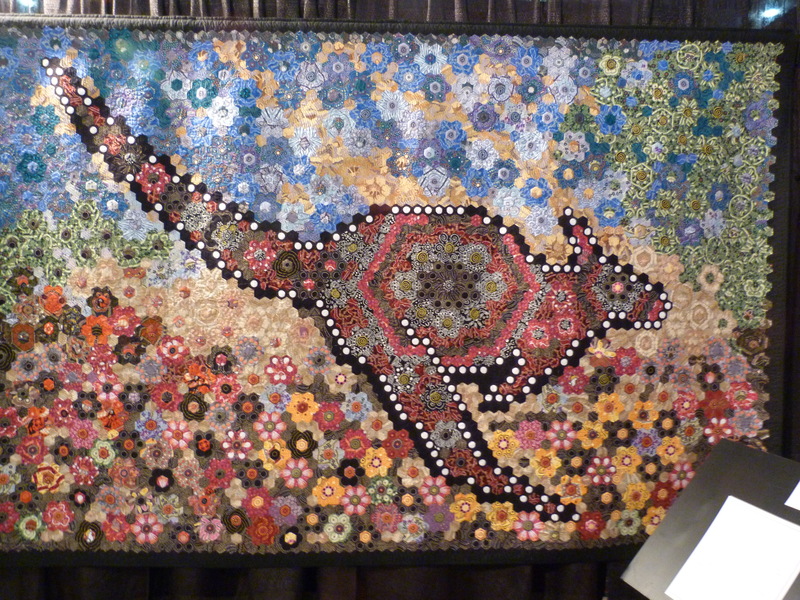 This contemporary Grandmother’s Flower Garden was designed in five weeks using 4,125 pieces depicting a running kangaroo, rays of dawn and flowers everywhere.” Together in a Friendship World was made by Geta Grama and Quilt.Ro Group, Rasnov, Brasnov, Romania. 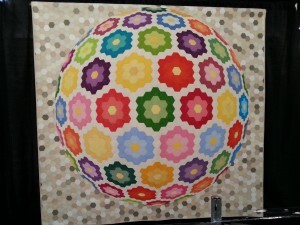 I was blown away when I saw this hexagon globe and returned to the quilt several times to look in more detail. I think the 3-d effect is amazing. 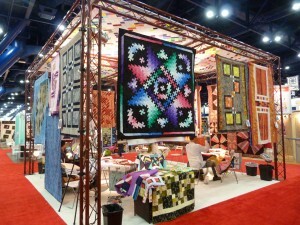 I love star quilts and the Feathered Star is a favorite. 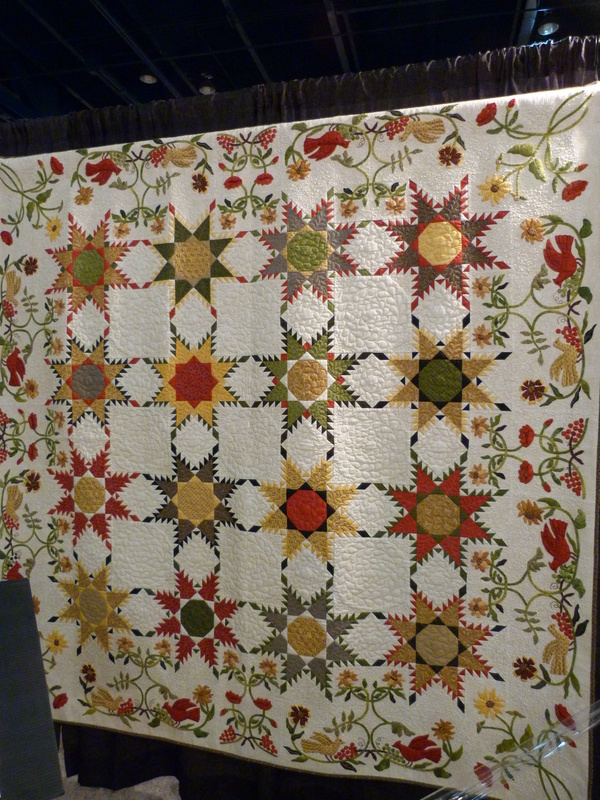 This gorgeous quilt, Celebration of Feathered Stars & Wildflowers, was a collaboration by 22 members of the Veriens Quilt Guild, Frederickson, TX and is their 2014 raffle quilt. 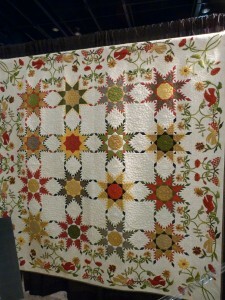 Helen Rode, Jan Graetzel, Joanie Wyall and Colleen Zabrenick masterminded and coordinated the project and the design was inspired by an antique quilt. The picture doesn’t do Jack by Sandy Curran, VA, justice. 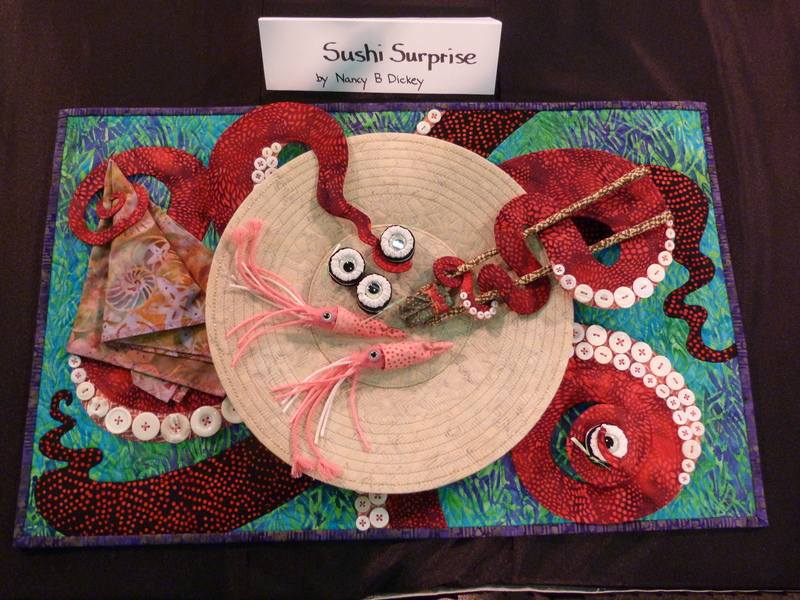 Sandy concentrates her work on the emotion and expression in eyes, both human and animal. 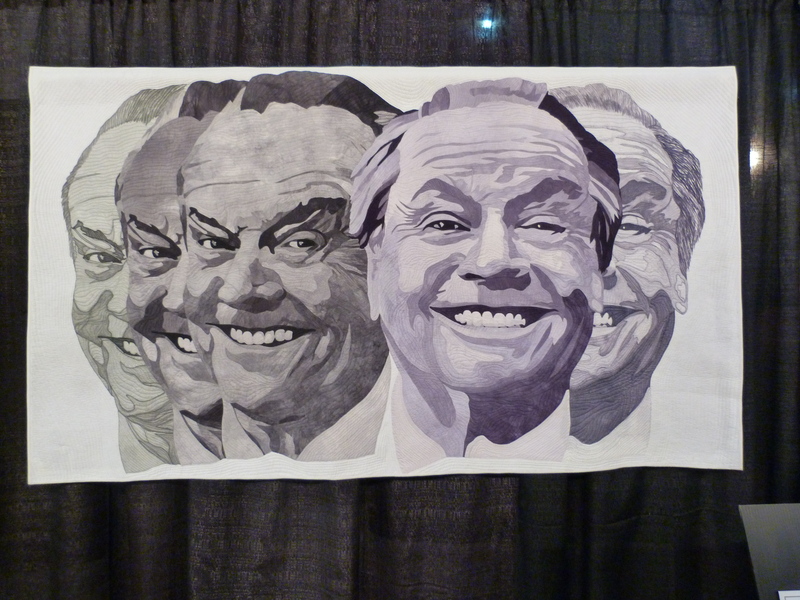 Jack Nicholson has such expressive eyes and this quilt was extraordinary in the likeness and the 3-d effect. I just loved these two parrots, Ricky and Lucy, by Nancy Sterrett Martin and Karen Sistek, KY. 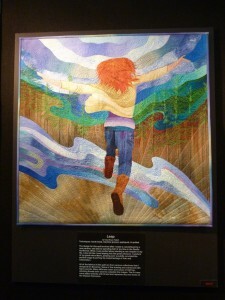 They are painted on silk and brought to life with the quilting stitches. 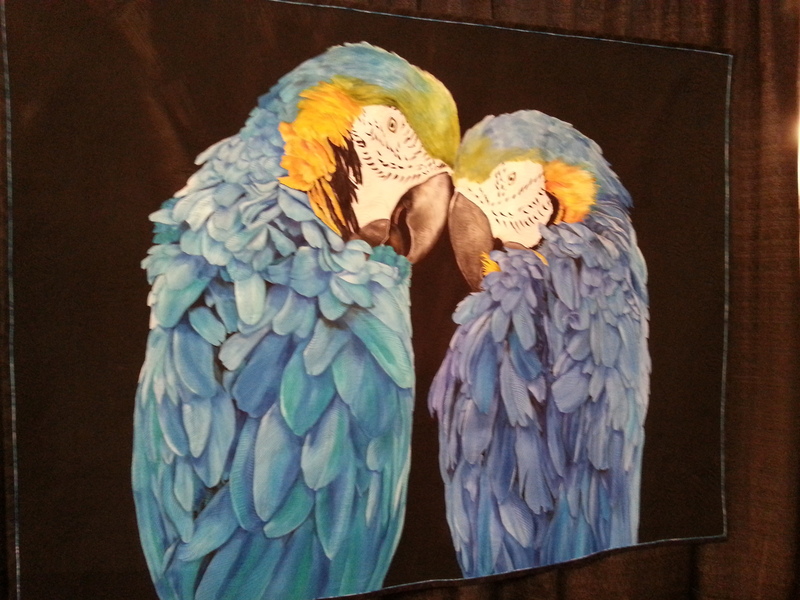 The design is based on a various photos of macaws and parrots. 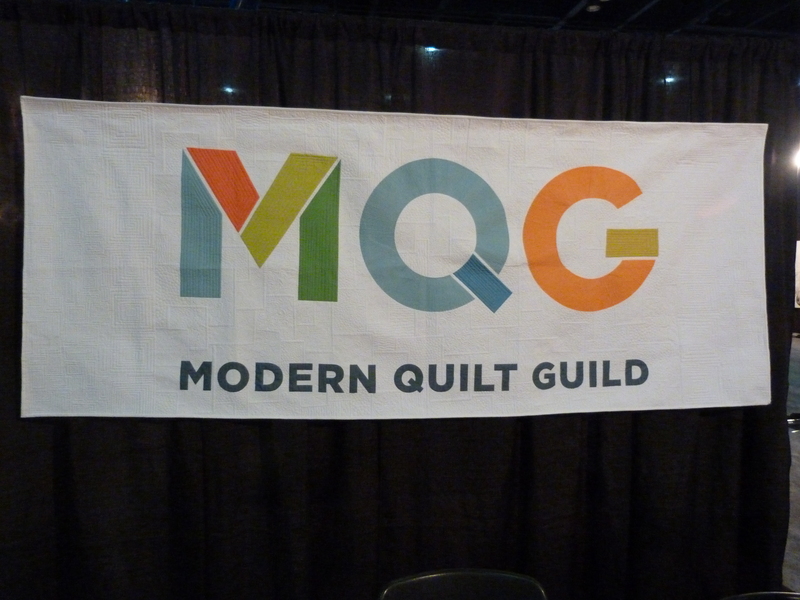 One of the many exhibits I enjoyed was the Modern Quilt Guild Showcase 2013. 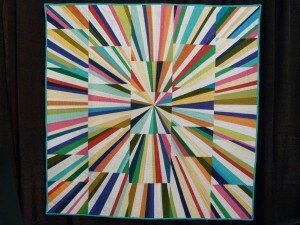 This fresh approach to quilting using sold colors often on a background of white, is popular, often appealing to younger quilters who want to make more contemporary looking quilts. 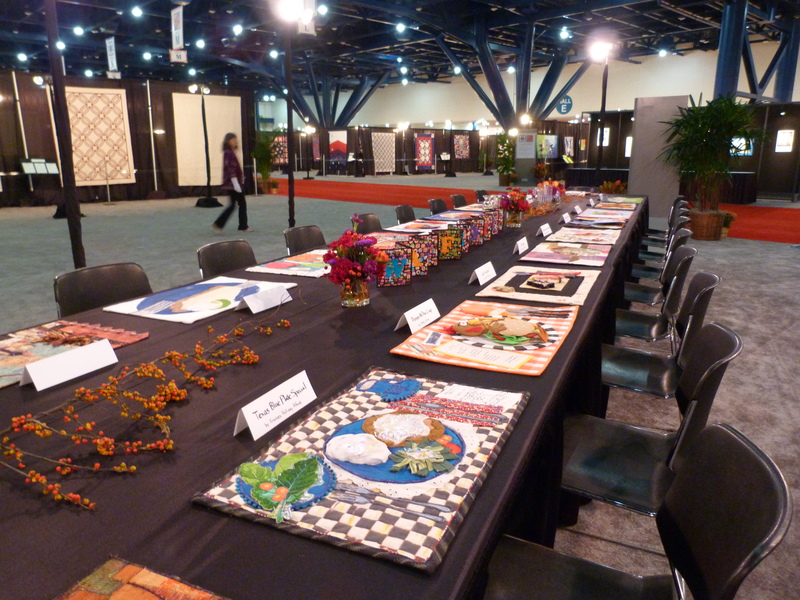 Here’s a sampling from the exhibit in which members from chapters of Modern Quilt Guilds around the world were invited to submit their works. 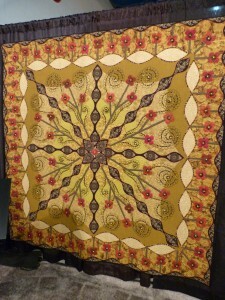 Bull’s Eye 1 by Colleen Wootton of WA, is digitally printed and machine quilted. 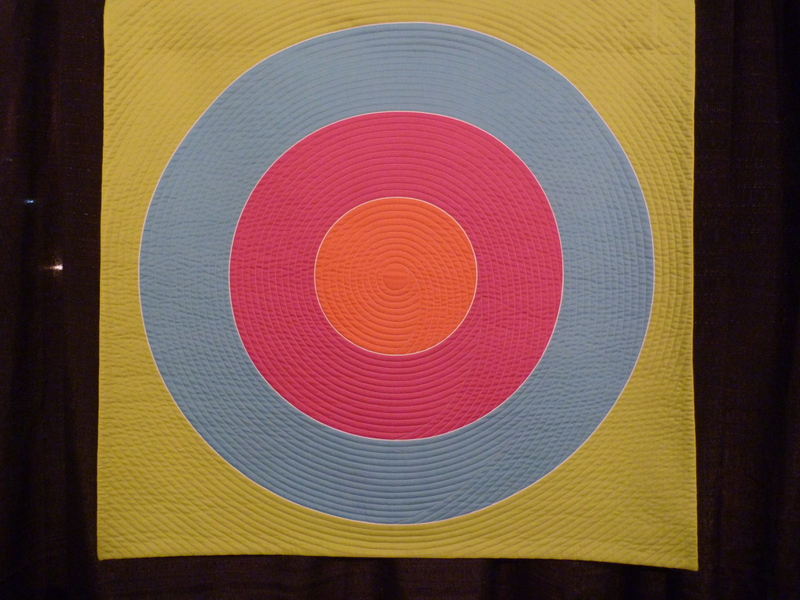 Colleen was inspired by Frank Stella and Ellsworth Kelley. She has used geometric shapes in designing two and three dimensional works for corporate America for almost 50 years and became adept at drawing these using the computer. Fireworks Quilt was designed and made by Tara Faughman, CA. 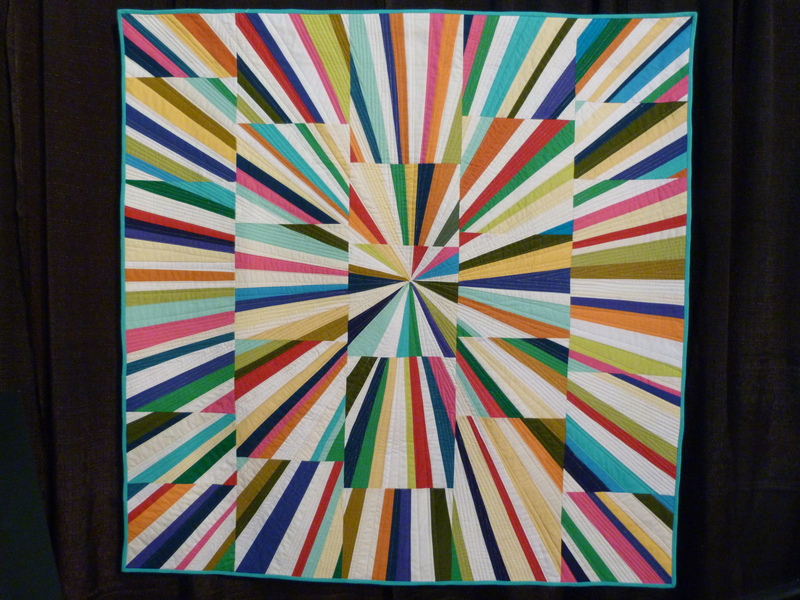 Tara writes, “I was working with the idea of broken lines for this quilt, playing with the interaction of spaces where the quilt blocks come together,” This is an explosive lively design which I love. 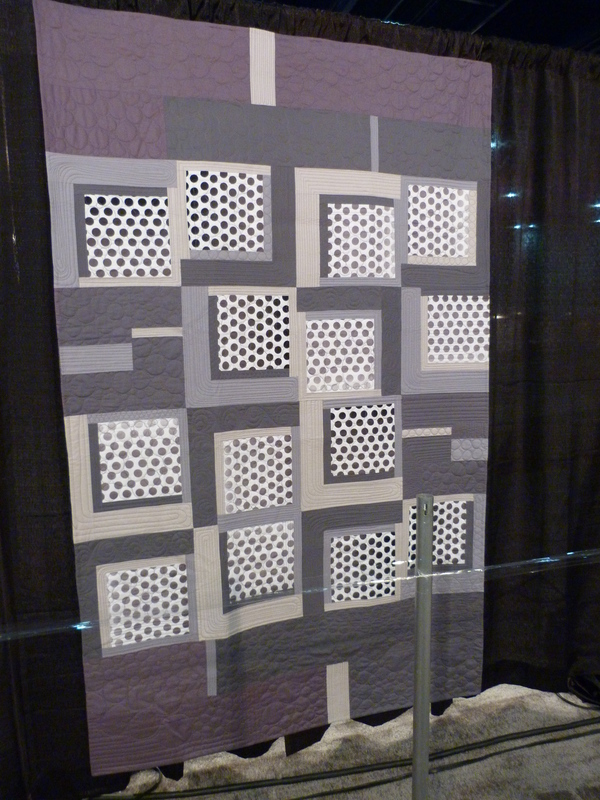 This grey-tone quilt made by Leslie Tucker Jenison, TX, is named Fifty Shades of Groovy for a little dot on the map of the cultural zeitgeist. 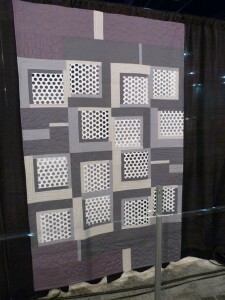 Leslie improvised the Log Cabin piecing technique and was inspired by her love of dots and greys. The large print on the back of the quilt is awesome – I wonder where she found that fabric! 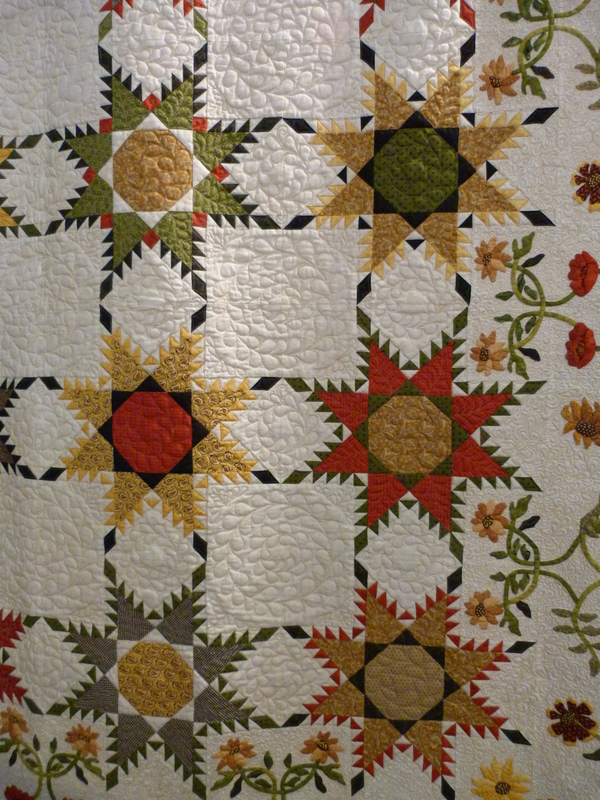 On the left, Sparkler, by Lee Heinrich, WI, and quilted by Jeny Pedigo is a modern interpretation of the tessellating Pudding and Pie block. 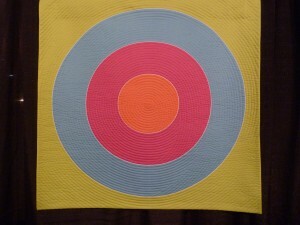 The solids on the white background give it a new look and the color transition is pleasing. 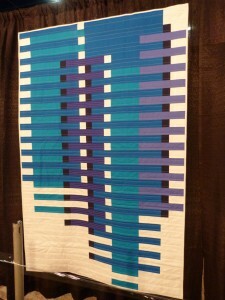 Rhythm and Blues by Anne Deister, CO, makes me think of the view of sky scrapers through blinds, but Anne was inspired by studying design elements in woven interior decorating fabrics. 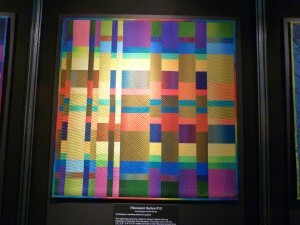 She writes, “I was interested in the interweave of colors that occur with the strong horizontal format of the weave. As the idea progressed, I became more intrigued with the vertical movement that could be created as different groups of lines interact with each other. 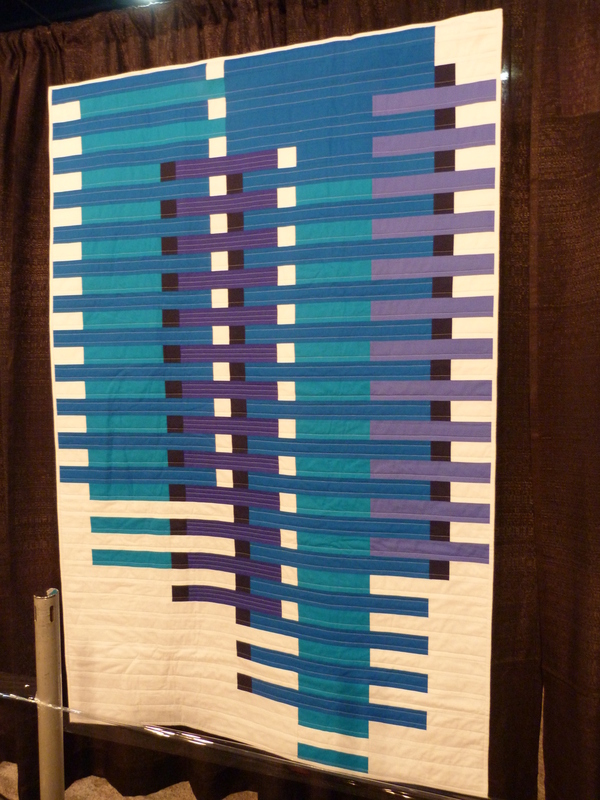 The quilt morphed into a digital representation of the sound bars on digital recording equipment and Rhythm and Blues was born.” The graphical qualities of this quilt really appeal to me and of course the blue, which is my favorite color. 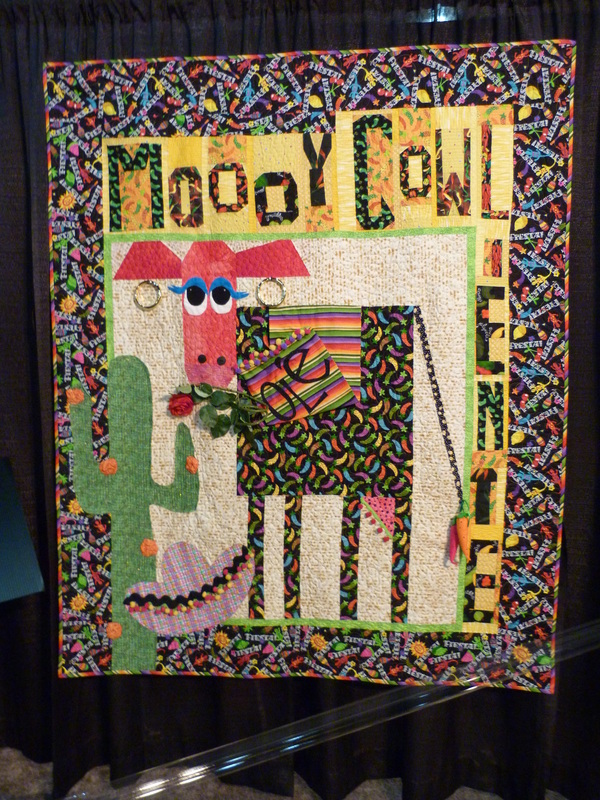 Here are some examples from the wonderfully whimsical MOO-Ston exhibit, curated by Melanie McFarland and Mary Lou Weidman. 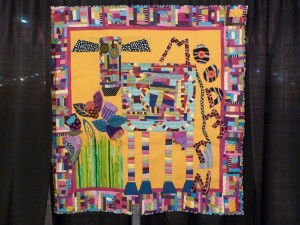 From a pattern in the book Out of the Box with Easy Blocks by Mary Lou Weidman and Melanie McFarland, friends and students have customized the “Purple Cow” into various bovine-inspired themes. 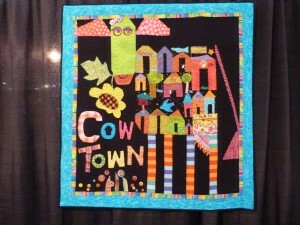 “Cow Town” by Mary Lou Weidman (WA) and quilted by Kathleen Woods is the first in a series made using the Purple Cow pattern. 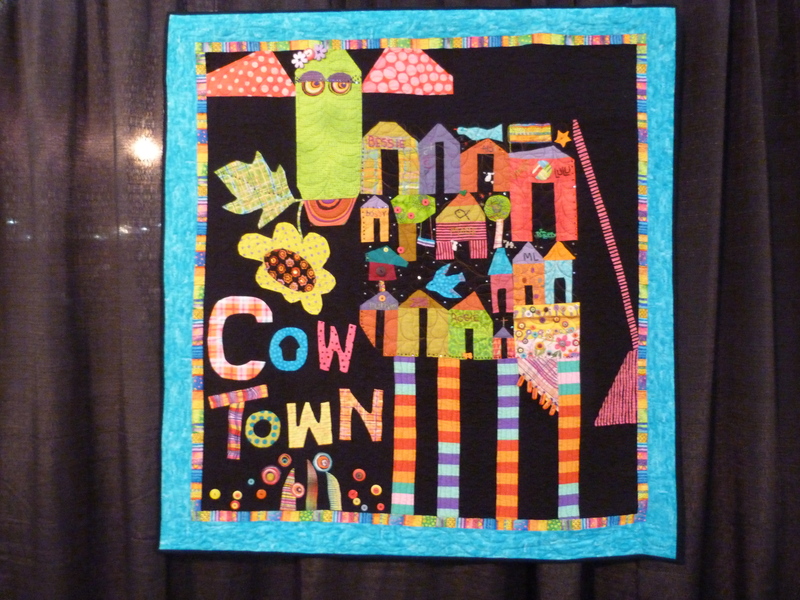 Mary Lou writes, “The body of this cow is made up of small houses with names over the doorways. I’ve named them after loving family members. It’s all about the fun – the udders are hot dogs!” Indeed – what fun! 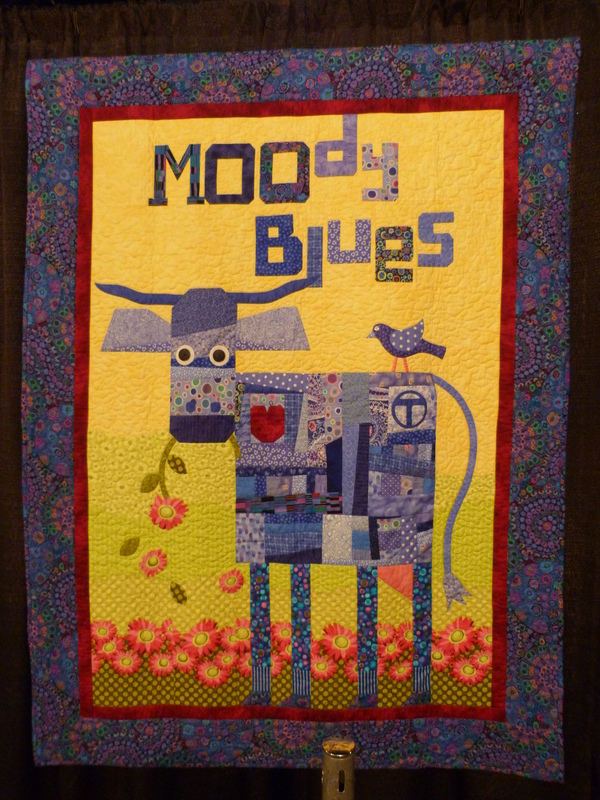 “MOOdern” is another by Mary Lou, and quilted by Kathleen. 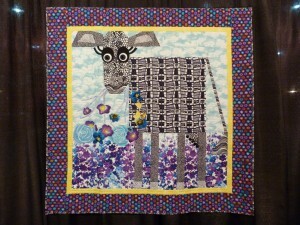 She used a cheater fabric from Robert Kaufman with the colors and shapes already there to make this cow in the “modern” style. 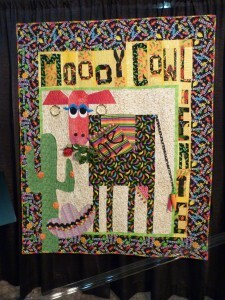 “MOO-ey COWliente” by Tina Nappl (CA) is made from a variety of chili fabrics. Even the lettering has chilies on it and the body of the cow has chilies of many colors. Check out the end of the tail too! 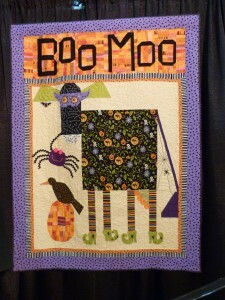 ” BOO-MOO” by Molly Evangelisti (CA) and quilted by Kathleen Woods has a Halloween theme, Molly’s favorite holiday. This cow is dressed and ready to party! I love her curly green spider shoes and pumpkin udders. 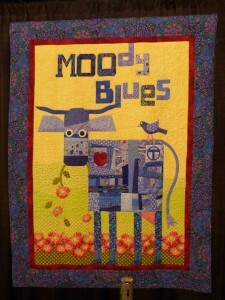 Here is “Moody Blues” by Laurie Latta (WA), quilted by Karen Brown. Laurie was inspired after attending a retreat with this exhibit’s curators, Mary Lou and Mel. She chose the theme based on her overabundance of blue fabric. She loves that her cow is part of the herd that has been traveling round the country. 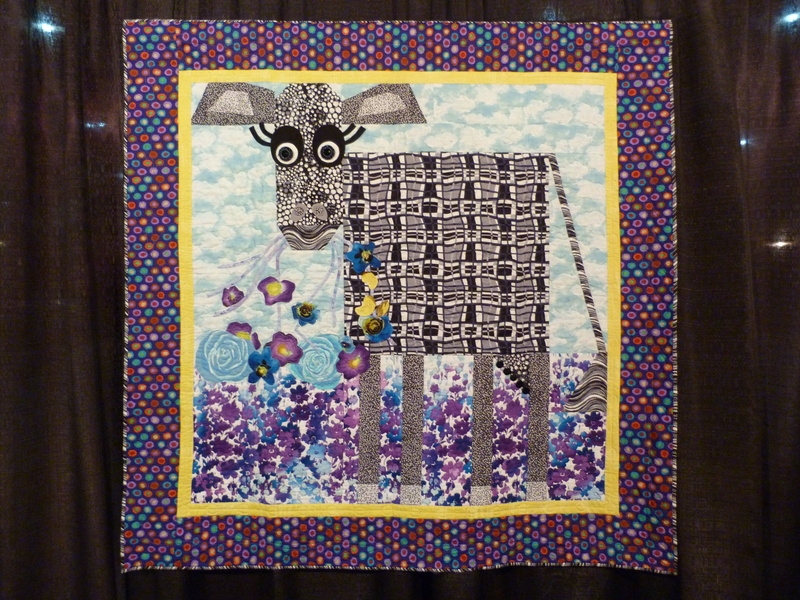 “She Eats the Meadow Flowers” by Rebecka Schafer (NE) and quilted by Rick O’Neal was inspired by a children’s poem by Robert Louis Stevenson about a cow that is loved and that likes to eat the meadow flowers. Great use of a variety of black and white prints in this cow and the eyes are wonderful. 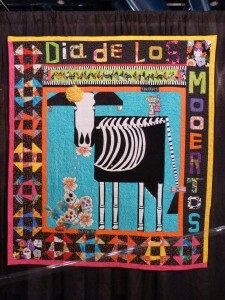 “Dia de los MOOertos” by Patricia Wood (TX) and quilted by Gaye McNett celebrates Patricia’s daughter’s love of Dia de la Muertos. 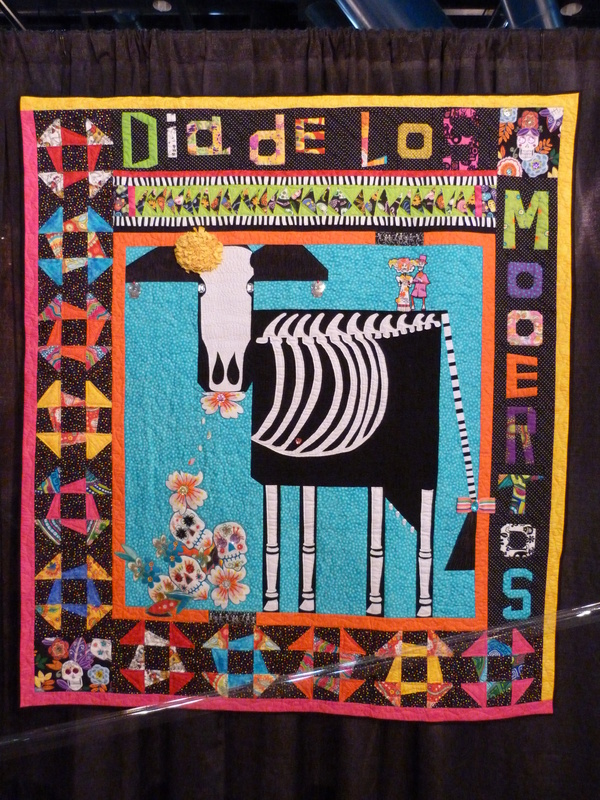 This skelletal cow is embellished with a variety of beads and the yellow flower is made from and old T-shirt. The udders are skull buttons and the cow is eating flowers from a pile of skulls. I really liked the strong graphics of this cow and the colorful borders with skewed Monkey Wrench blocks and wonky Flying Geese. 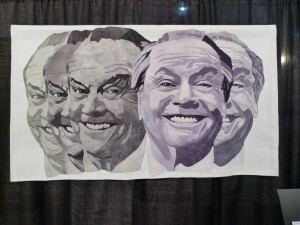 This was an exhibit which made people laugh and smile. The cows each had their own characters and many were heavily embellished with all kinds of amusing details in a variety of materials. Perhaps this herd will travel in your direction. If so, be sure to visit them. For many years, I have admired the brilliance of Caryl Bryer Fallert-Gentry’s quilts. 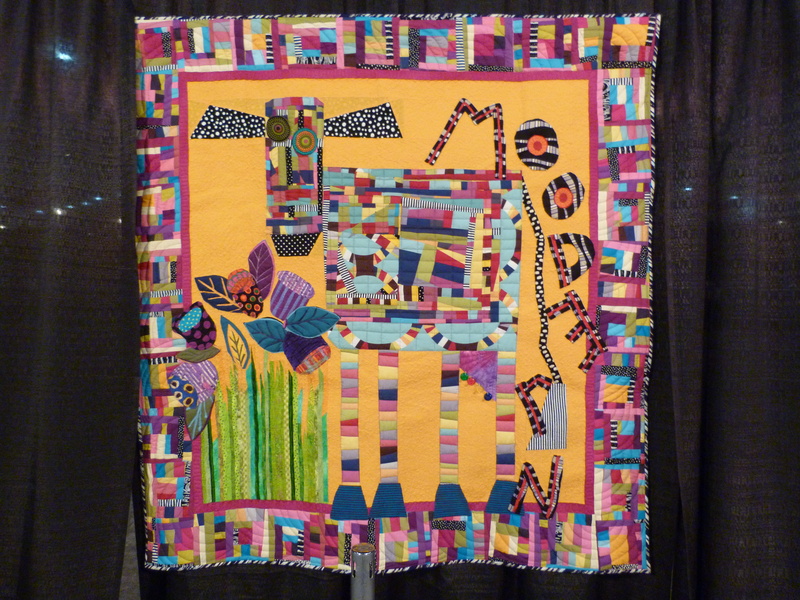 Her work is outstanding in so many ways including her color choices, the pleasing shapes and curves she develops in her designs and the precision and excellence with the quilts are pieced, appliqued and quilted. 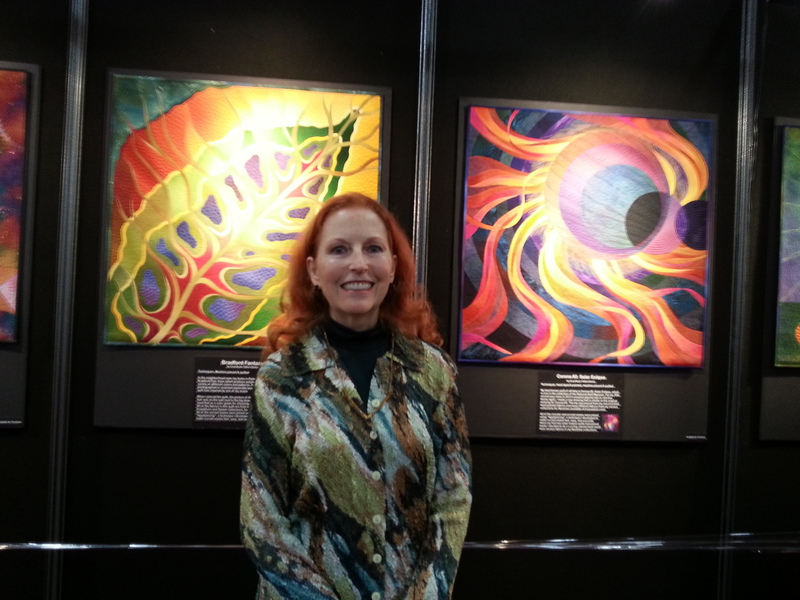 I was excited to see Caryl’s special exhibit “Celebrating 30 Years of Color and Light – New Works by Caryl Bryer Fallert-Gentry, and I enjoyed talking to her. The 30 new quilts revisit many of the themes of her past award-winning work and introduce new themes. 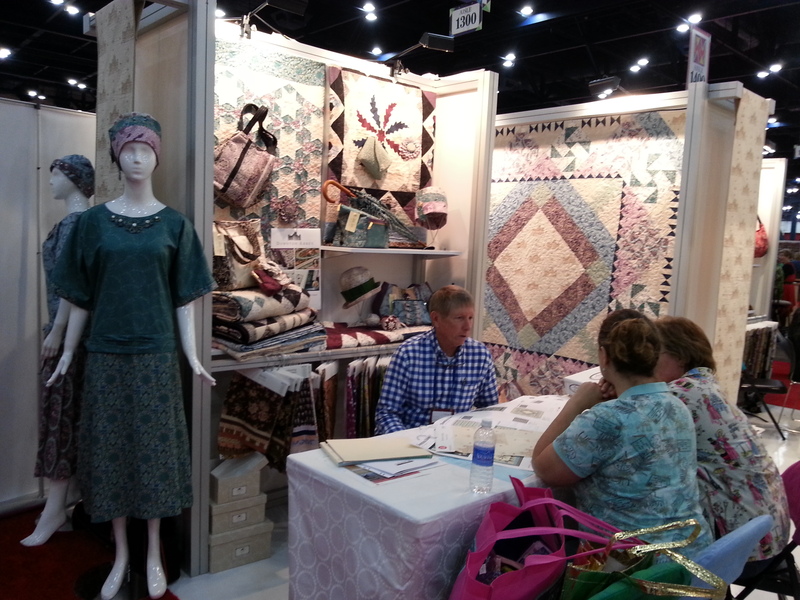 All of them were made with fabric from the various collections she has designed for Benartex, based on her original hand-dyed and painted fabrics. “Feathers in the Wind #2” arose from a series of drawings of fantasy feathers. 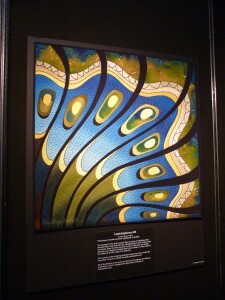 The value placement of fabric in the plumes of the feathers creates the illusion that they are lit from within. 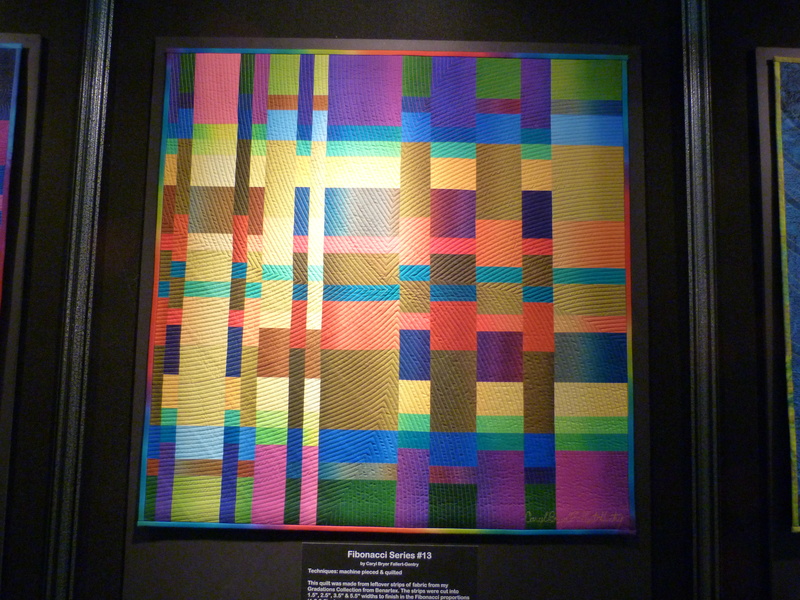 “Fibonacci Series #13” was made from strips cut in widths to finish in the Fibonacci proportions, (1, 2, 3, 5), when sewn together. These were then counter-cut in the same proportions and every other strip was rotated by 180 degrees. “Spirogyra #4” was inspired by a small clipping from a magazine showing the image of spirogyra through a microscope. 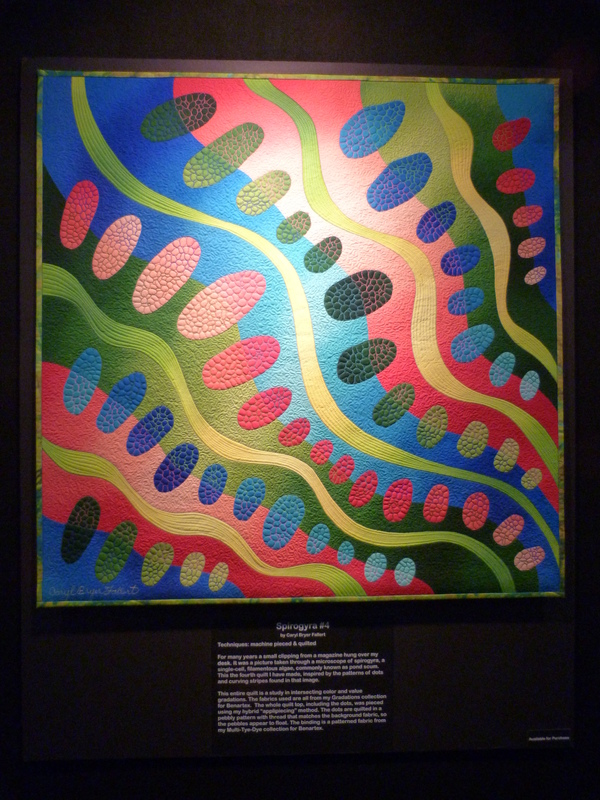 This is the fourth spirogyra quilt in which the patterns of dots and curving stripes appearing the in the microscopic view of these filamentous algae are explored. The design for “Lepidopteran #3” evolved from a series of sketches of a leaf which was similar in many ways to the patterns on the wings of a butterfly. 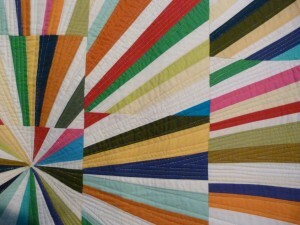 My photos don’t do these quilts the justice they deserve, but they should at least give you a taste. I imagine this exhibit will travel, so do go and see it if you can. I grabbed time whenever possible to explore the many special exhibits on display. During Market, most attendees are too busy ordering supplies for their stores, so the aisles in the quilt exhibits are blissfully free of people and it is easy to view the diverse array of quilts. 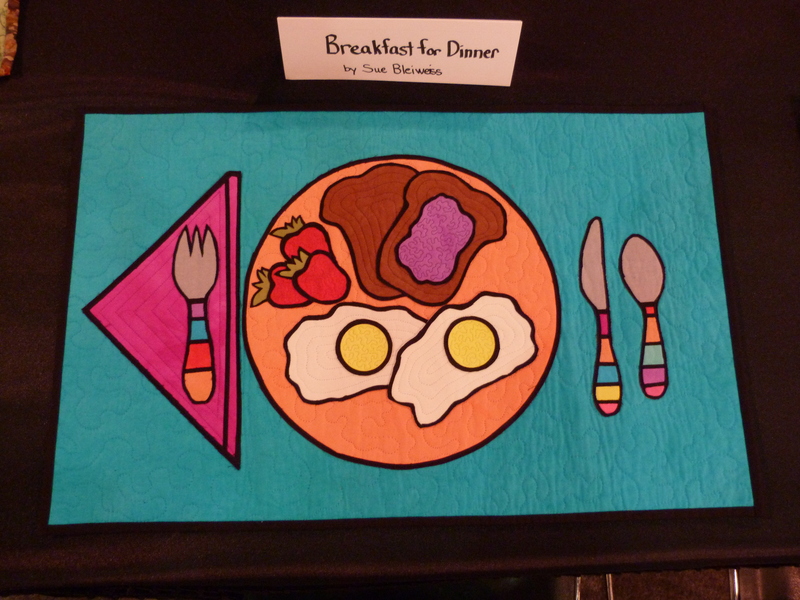 What a joy to see the What’s for Dinner exhibit curated by Jamie Fingal of Orange, CA and Leslie Tucker Jenison of San Antonio, CA. Their idea of inviting quilters to make a quilted place setting at a dinner table was brilliant. 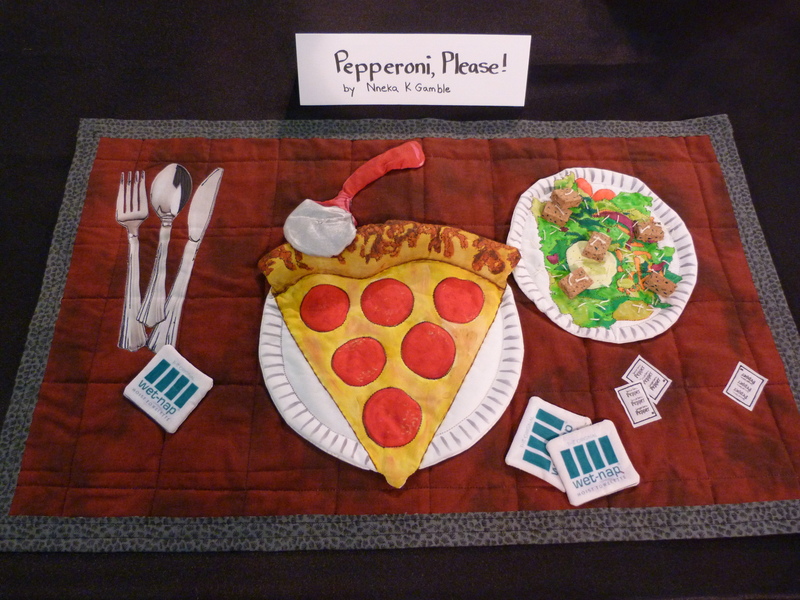 Many quilters have a passion for food, so setting the table with quilts depicting plates complete with food makes perfect sense! Enjoy this selection from the long dinner table. 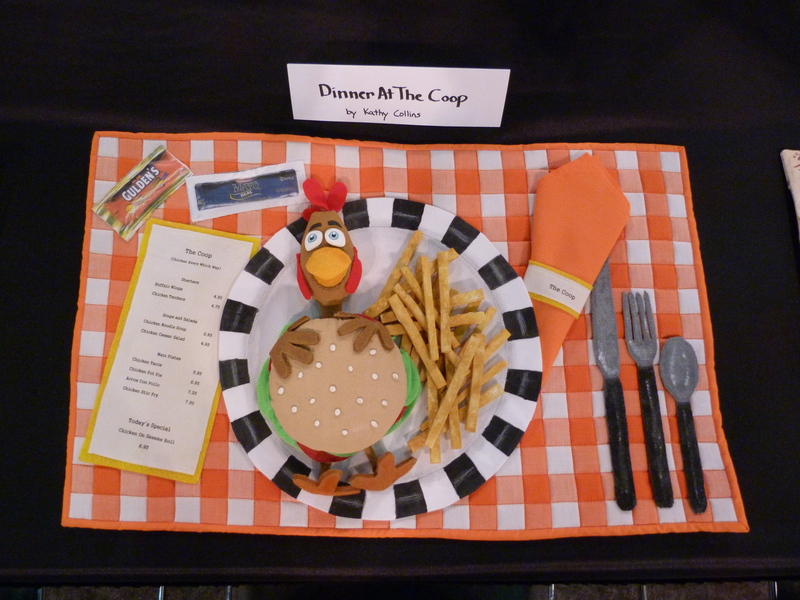 The chicken burger and fries made me laugh out loud – “Dinner at the Coup” by Kathy Collins. 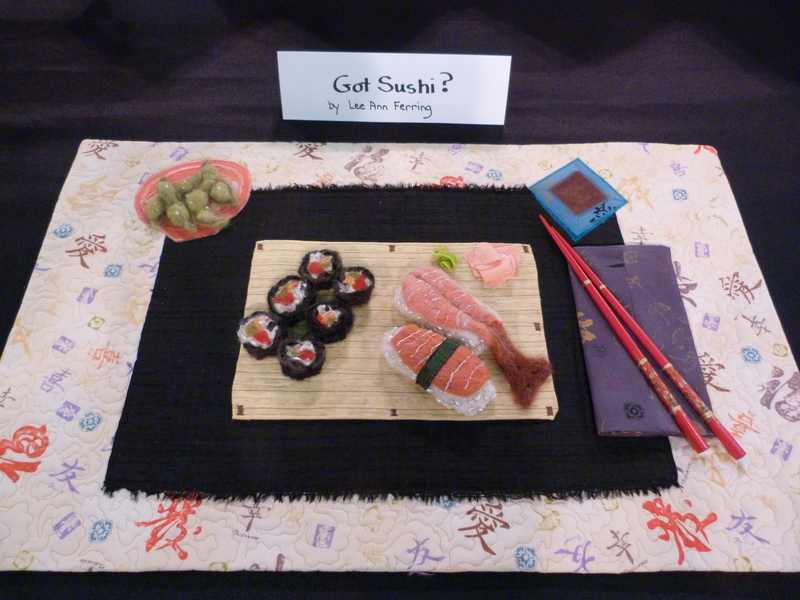 Here are two sushi plates. “Got Sushi?” by Lee Ann Ferring has wonderful felted morsels tastefully arranged. “Sushi Surprise” by Nancy B Dicky was at the head of the table. I love the squid complete with eyes and her octopus tentacles with button suckers wrapped around the chop sticks. 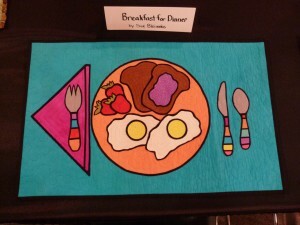 “Breakfast for Dinner” by Sue Bleiweiss was bright and graphical. 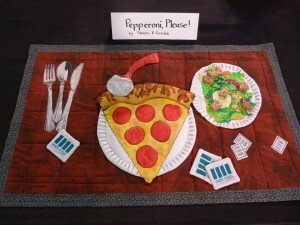 In “Pepperoni, Please!” by Nneka K Gamble the pizza looked a whole lot more appetizing than the salad! 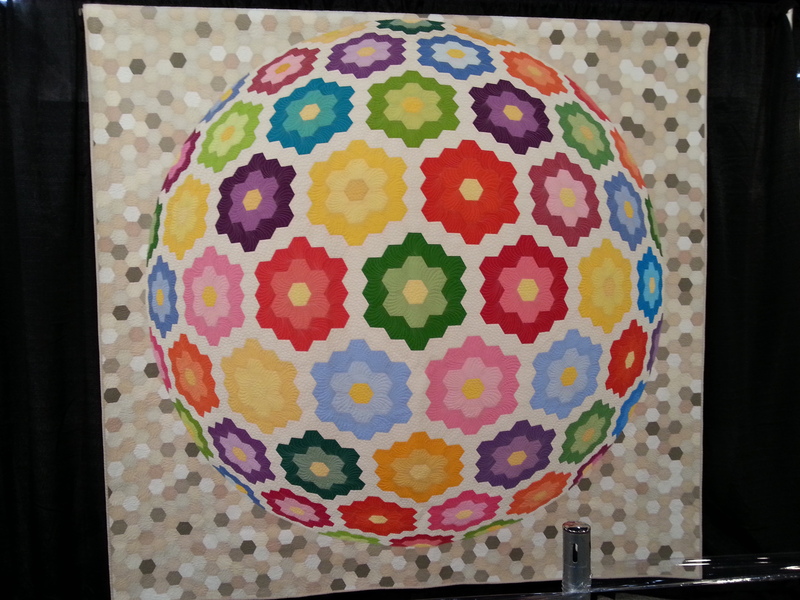 In both of these, I like the juxtaposition of the strong geometric shapes of the triangle and circle. “I Do It! 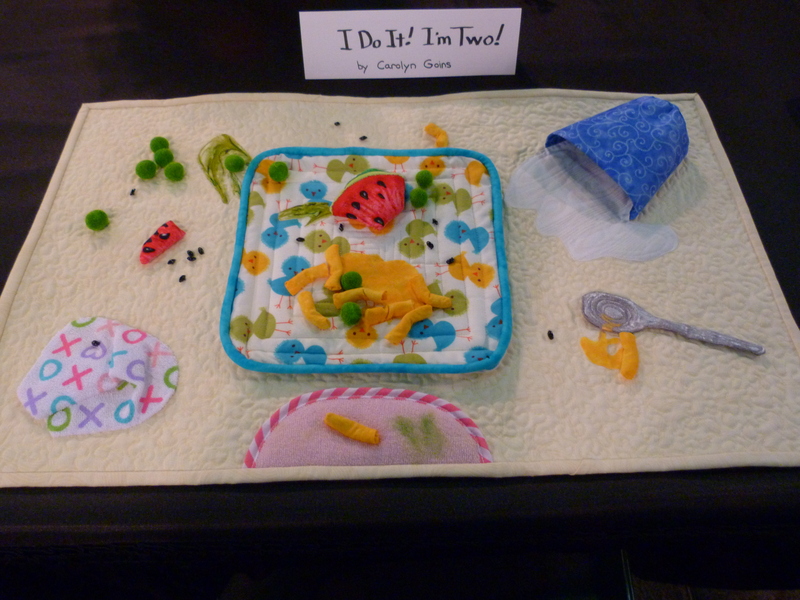 I’m Two” by Carolyn Goins was a perfect toddler’s mix of food particles spread across the setting. 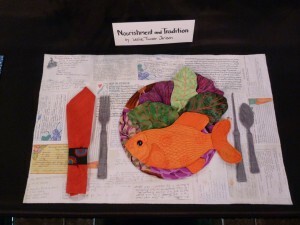 “Nourishment and Tradition” by Leslie Tucker Jenison gives us a healthy fish and greens plate on a mat covered with recipes. This exhibit was such fun and everyone who came to look while I was there was captivated. inspired and amused. 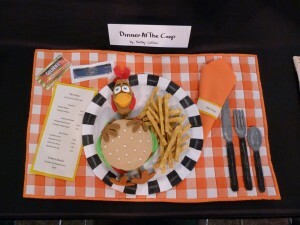 Each setting was so creative and entertaining. 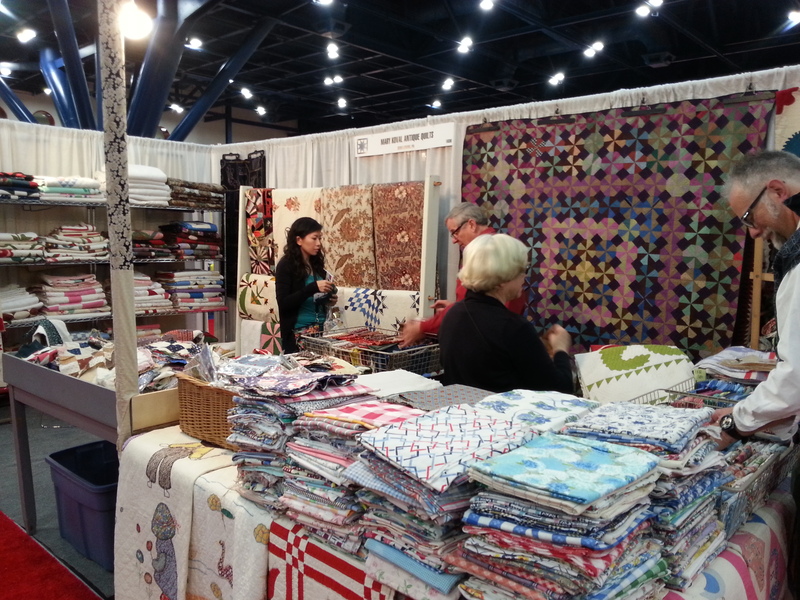 Quilt Market may be overwhelming. 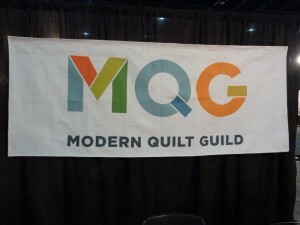 The George Brown Convention Center is huge and there were over 700 booths. 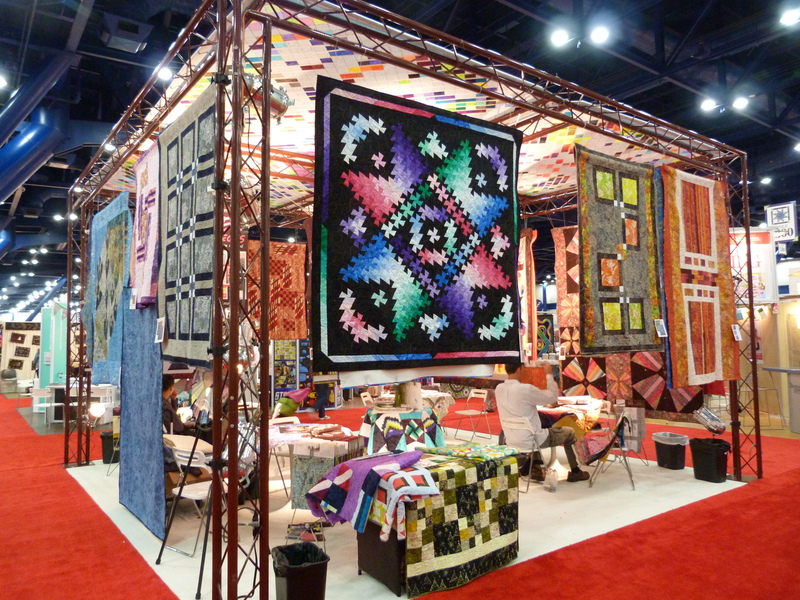 I know I didn’t see them all as I was eager to see the quilt exhibits too and there wasn’t enough time to do it all. Here’s a sampling of some of the booths that I particularly enjoyed for a variety of reasons. 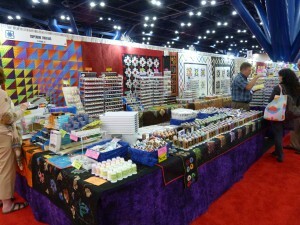 There was such an array of colorful threads at the Superior Threads booth with all the bobbins neatly lined up. The Be Colorful booth with Jacqueline de Jonge’s wonderful quilts was a real eye-catcher. 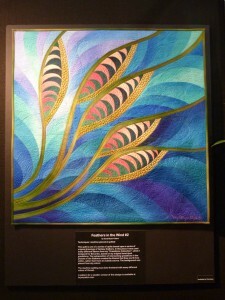 I admire her geometric patterns as well as the vibrant colors. This Fairfield tower of sculpted batting was cleverly designed. 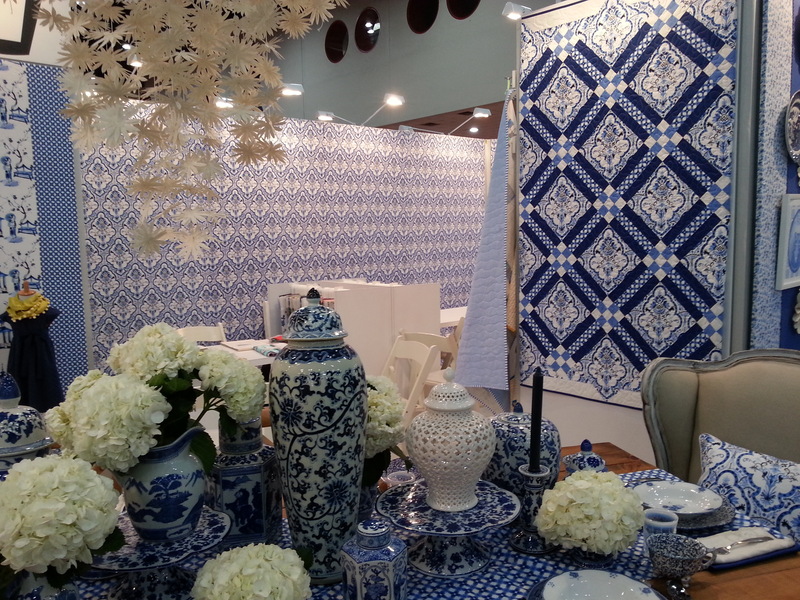 Once again as in Portland, Micheal Miller Fabrics decorated a booth beautifully this time in elegant blue and white. 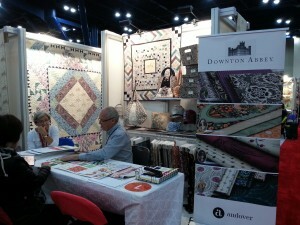 There was much buzz about Andover’s new line of Downton Abbey fabric. 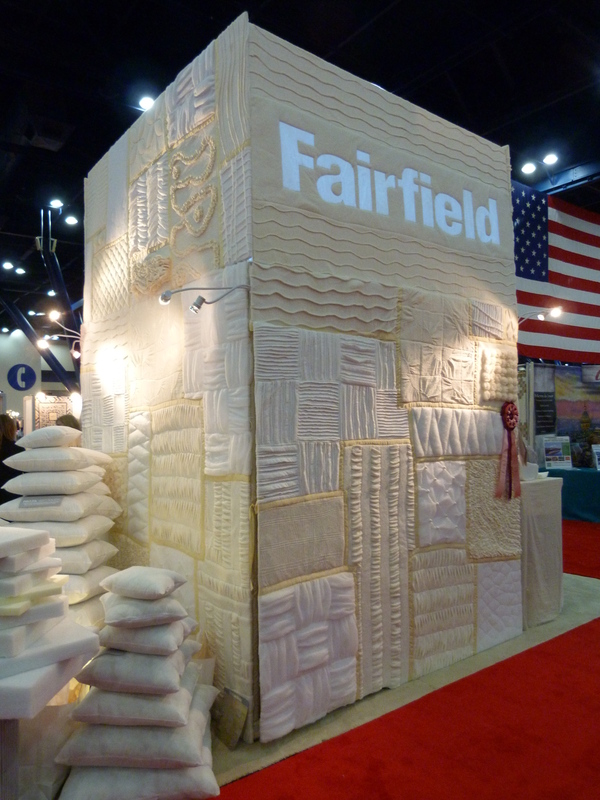 On the day of the Schoolhouse presentations, they unveiled this new fabric line and 1,500 people attended! They have a design named for each of the Downton ladies. 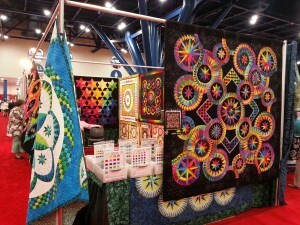 The quilt in the background of both pictures was made by QuiltWoman.com President, Nancy Dill. 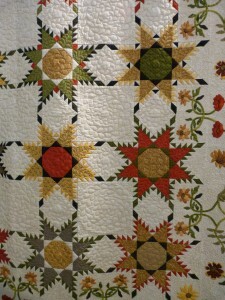 I’m sure this fabric will hit the shelves in many quilt shops very soon. 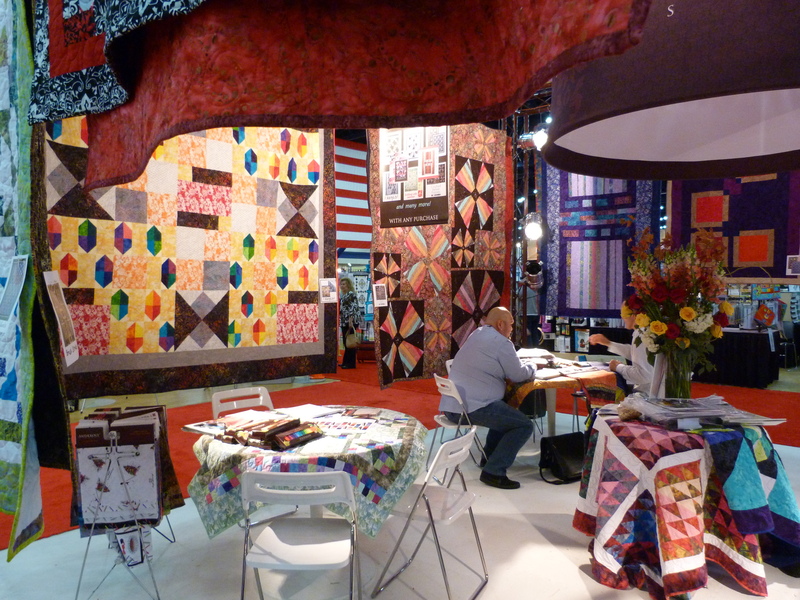 Anthology Fabrics had their amazing quilt canopy over their booth and many attractive quilts making the booth very inviting. 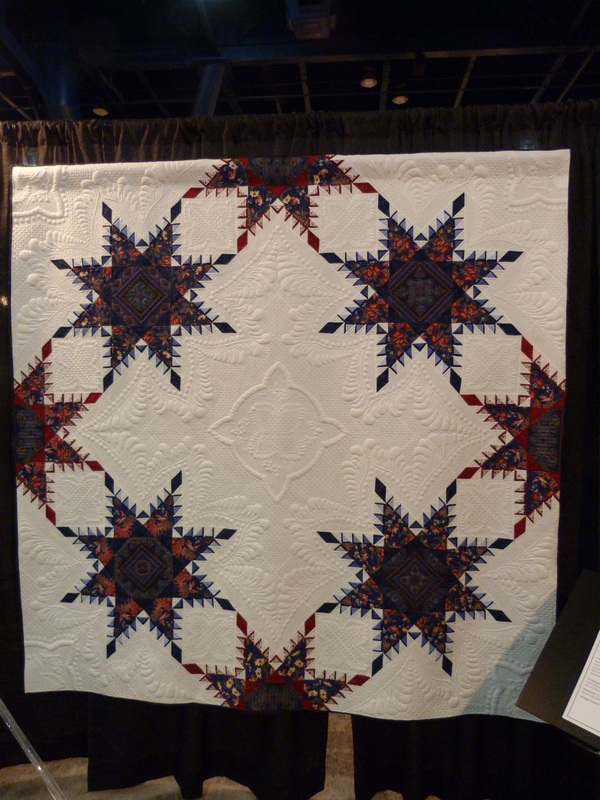 The star quilt was particularly striking. 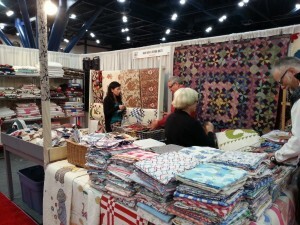 Jordan Fabrics had a wonderful display of table runners/bed toppers and it was inspiring to see. I enjoyed reconnecting with Mary and Joe Koval at their antique quilt booth. About 10 years ago, I purchased a lovely antique blue and white Bear’s Paw quilt from them which I have upstairs over the banisters in my house. They always have some real treasures. 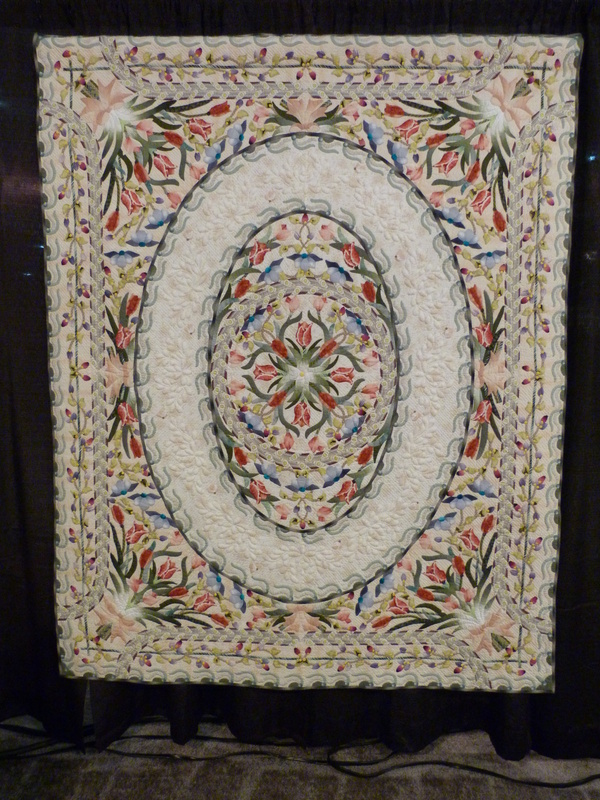 The backdrop quilt is silk from Pennsylvania and dated between 1790 and 1810 – a truly magnificent piece.